My first try at this so hope its right. My, my, you have a nice stash..... and the quilt is really cute. Oh that's nice. I love frogs. Oh, how fun!! Your little hoppy frogs are going to make someone smile. Your quilting is just right for the pattern. Good job! Cute! 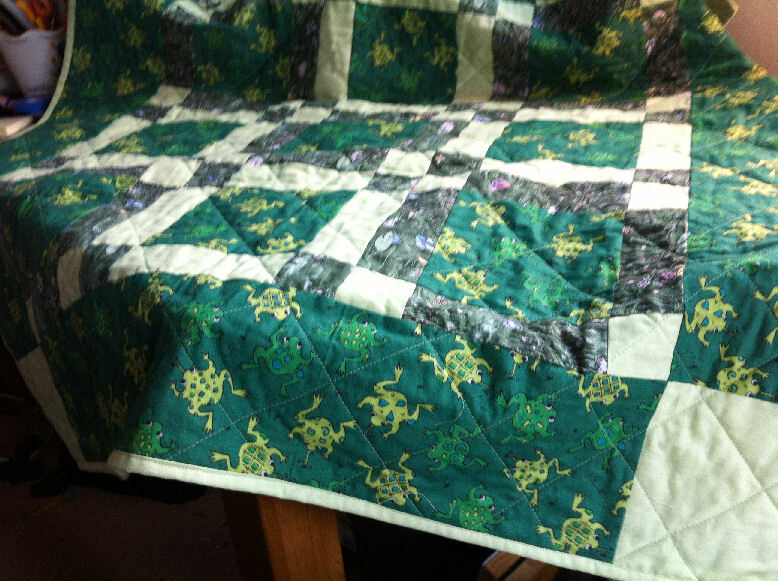 I have frog quilt waiting to be quilted...love those frogs! Looks great! Thanks for the idea for a way to use some of my stash. Love those frogs! I have a lot of stash, but am suffering from the doldrums right now. Hopefully will get back and try to make something as cute as you did! Great use of very pretty fabric!! I am so not good at FMQ so I use straight line most of the time. You have a lot of frog fabric stash!!! Love your quilt! Cute frogs - looks like they are jumping around the lilly pond. Really a fun quilt. Isn't it amazing how you can shop your stash, use ten yards and still see no change? I really like your frog quilt! Very cute quilt. I have that same frog fabric. Nice job! It is so fun to use scraps! Another hoppy quilt to liven up the house. Enjoy!